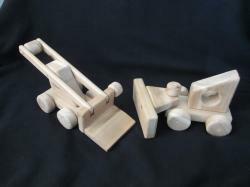 Click Image to Enlarge Wooden Action Toys! Click Image to Enlarge Adventures of all kinds are hidden in these simple, natural, handmade toys and the imagination of a child. 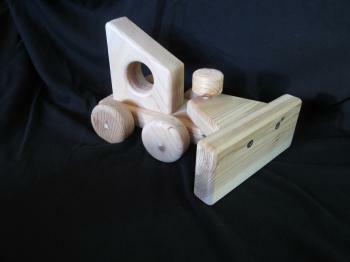 Natural western red cedar, non-toxic & ready for play. All edges and corners are rounded for appearance and safety. 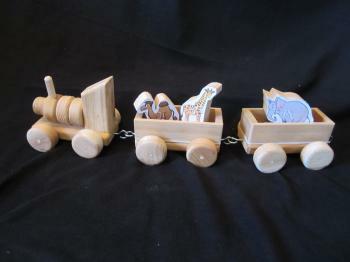 There are no small parts to break off and all removable pieces are large enough not to be choking hazards. 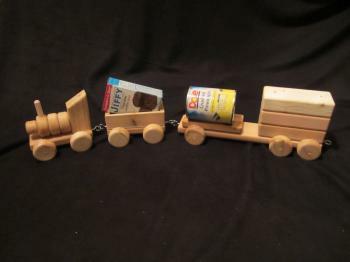 Recommended for ages 3 and up. 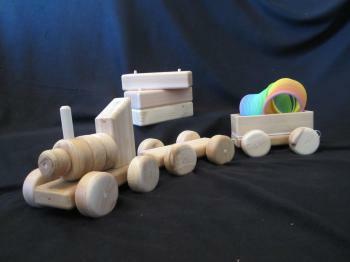 The train engine is designed to be taken apart for painting or play, but there are no small parts. The train base is made up of 4 individual 2-inch wheels an inch thick which press fit on 2 5-inch axles that turn freely in holes in the 6-inch base. 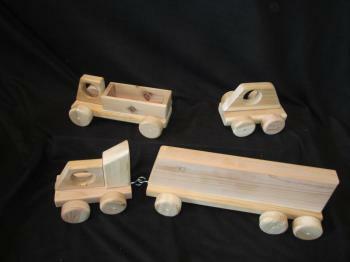 The train body is made up of a 1-3/8 inch nose wheel glued to a 5-inch dowel on which the other 3 2-inch wheels fit. The smokestack is securely glued into one large wheel. This assembly fits into a hole bored in the cab which is screwed to the base and can be removed for painting. This car is 6-inches long and is designed to hold toy figures as well as the individual size cereal boxes. Inside dimensions are 5"L x 2"W x 1.5"H.
All cars have strong eye hooks on both ends to easily allow cars to be hooked and unhooked. There is a dual water nozzle mounted at the top of the ladder which can rotate/swivel in any direction and is removable. The back of the fire truck has 2 fire hose connections which also swivel. The front of the ladder trailer has a 6-inch equipment box. Pickup truck is 9 inches long. Bulldozer is 9 inches long and has a handle/knob to pivot the blade left and right. Blade can be raised straight up and down on pivot dowel. 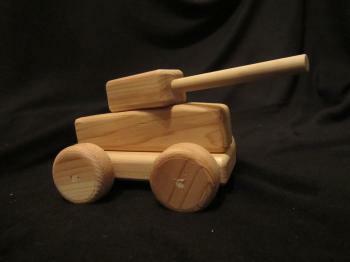 Tank is 9 inches long with a 4 inch x 1/2 diameter barrel which is glued securely into the turret. The barrel turret rotates a full 360 degrees and is removable. Tank body is screwed to base and can be removed for painting. 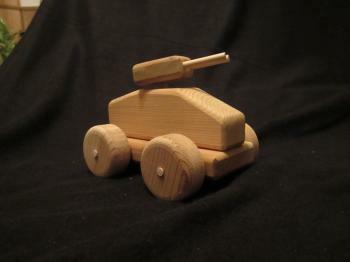 Humvee is 6 inches long with a twin gun turret. The barrels are 1-1/2 inches long x 1/4 which are glued securely into the turret. The barrel turret rotates a full 360 degrees and is removable. Humvee body is screwed to base and can be removed for painting.